Always be on the lookout for your enemies being close to you. Now, I am not saying that all of your friends, associates, and close friends are your enemies, but I am recommending that you be watchful of the people who you allow to enter into your circle of friends and associates. Although you may be the type of person who is so trusting of people, you have to keep a certain level of resistance to telling people everything. Of course, in a perfect world, you would like to think that you can tell people secrets and confidential things and not have those things told to others. Unfortunately, we don’t live in a perfect world. In this less than perfect world, we have to be smart enough to know that everyone we talk to is not our friends, and everyone who we call a “friend” is not our real friends. Your “friends” can be some of the most jealous, envious, and uncaring people you will encounter in this human experience. You have to be careful about how the people around you will use you for what they can get from you and then stab you in the back just as soon as they get a chance. In fact, people can be stabbing you in the back while you are helping them. It is so despicable that you can be making such a strong effort to really help people, but those same people can be working against you, talking about you behind your back, defaming your character, passing along private information you have provided them, and taking out of context some of the things you have told them. When people have placed great trust in you, you should at least have the decency to have some level of care for them that you would not attempt to do anything that would cause them harm or potentially cause them harm. When you go and confront these close enemies, the first thing that they will do is deny anything that they have done. No matter how good you try to be to some people, some of them will still do things to try to hurt you. When you maintain a snake as a friend, you better expect that snake to raise its head and bite the dickens out of you. 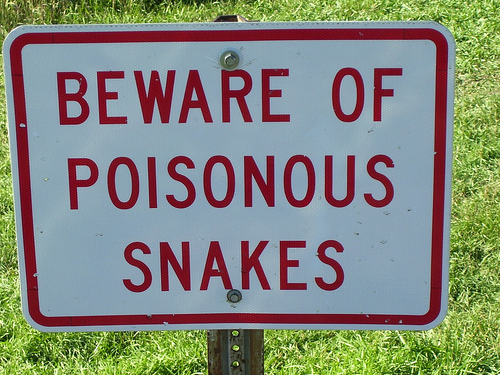 Ultimately, you have to rid yourself of snakes in the grass or else they will kill you. You don’t have to be uneasy around your friends and associates—just be smart about what you say to them and what you do around them. You should never tell anyone everything in the first place. What those snakes in the grass have to understand is you know significant information about them that you can also use to harm them too. When you use this information, don’t feel horrible about it—this is simply counterpunching! Never attack but don’t hesitate to counterpunch! Even when you separate yourself from these snakes in the grass, you still have to watch out for the things that they may try to do to you. You have to be ready with a counter to what they may do and say. Snakes in the grass emerge from Satan’s influence. When you are dealing with snakes in the grass, please know that you are going to have to combat them more than just physically—you’re going to have to fight them spiritually too. I would encourage people to not allow themselves to become snakes in the grass. You will find that you will be generating a self-inflicted wound that you will never be able to mend. Keep that in mind snakes in the grass and future snakes in the grass.